Having a close friend who is there for you, and who understand you- is one of the best feelings in the world. Sometimes it feels like romantic relationships just come and go, but friends can truly last a lifetime. 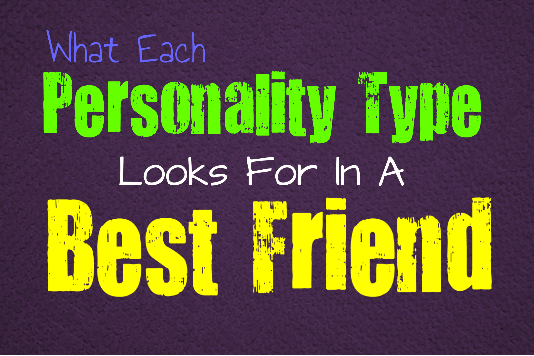 Here is what each personality type is searching for in a best friend. INFJs want a best friend who they feel comfortable to be themselves around. They struggle to open up to people, but this is often because they know that people can hurt them. When the INFJ loves, they do it very deeply and in a lasting way. They want a best friend who will commit to their friendship, and who will take it just as seriously as they would a romantic relationship. This connection is important to the INFJ, and they want someone who they can feel truly bonded to. This does not mean that the INFJ needs to speak with their best friend constantly, if the connection is there then they can feel it even through the distance. The INFJ wants a friendship where they can support their best friend, but also feel supported in return. Just knowing that their friend cares enough to take time out of their day for the INFJ, means the absolute world to them. Feeling understood is a very big deal for INFJs, and if their best friend can make them feel this way- they will hold onto them forever. ENFJs want a best friend who is open and honest with them, and who enjoys the same activities as them. ENFJs are also very busy people, so they need a friend who can keep up with them, or who at least does not get upset if the ENFJ cannot be available at all hours of the day. They will certainly attempt to be everything to everyone, but enjoy someone who actually understands and appreciates their effort. Having a best friend who sincerely wants to support the ENFJ as much as they support them, is going to go a long way for them. Someone who can sit and chat with them after they have had a long day, and just share that connection- this is truly important for the ENFJ. Although they are usually friends with just about everyone, the ENFJ reserves a very special spot for their closest friend. INFPs want a best friend who is loyal and honest with them. They do not want someone who is going to lie to their face, and say something entirely different behind their back. They need someone who has a strong sense of morals, and who understands the importance of trust. INFPs simply want someone who understands them, and does not judge them for being different. They make amazing best friends, and will be the biggest supporter of the people they love. INFPs simply want to feel loved and appreciated by their best friend. They do need space to be alone, but if they care for someone enough- they can actually share this space with them. Sitting in silence, just being near someone special- is actually very energizing for an INFP. ENFPs want a best friend who is eager to share in their adventures together. They want someone who makes them laugh and who actually wants to bring joy and positivity into their world. Someone who is constantly bringing them down, and doesn’t want to try new things- is going to be difficult for the ENFP to be close to. They want a best friend who enjoys exploring possibilities with them, and who can support them always. ENFPs dislike judgmental people, and because of this they want a best friend who will not judge them. ENFPs are friendly individuals, but might be a bit pickier when it comes to their best friend. They need a partner in crime, someone who they can share their best moments with. INTJs want a best friend who can come close to keeping up with them. Someone who can spark their mind and keep the conversation interesting- is truly valuable for the INTJ. They do not want a flighty friend, especially when it comes to loyalty and honesty. INTJs want someone they can trust, and who understands them. They need plenty of alone time, and because of this the INTJ needs a friend who can appreciate their need for space. Being able to have long conversations about many different subjects, without getting bored by the other person, that is the most valuable quality for an INTJ. The most important qualities for an ENTJ are intelligence and loyalty. They want a best friend who is trustworthy, and who won’t turn their back on them. They may not be the most emotional people, but they are actually very supportive and caring towards their loved ones. ENTJs simply want a best friend who is going to stand by their side, even if times get a bit rough. Having someone who they can trust entirely, means the absolute world to them. INTPs want a best friend who they can share their passions with. Someone who can keep up with their often spiraling train of thought- is one of the most valuable things for the INTP. They want a best friend who can follow their way of thinking and actually provide interesting and thought provoking responses. They also want someone who they can trust and rely on- especially if the INTP decides to disappear for a while. They sometimes need long periods of time spent alone, and having a best friend who understands that is ideal for them. ENTPs want a best friend who does not try to stifle their creativity, or their excitement. Someone who they can spend time debating with, and who will not get hurt over it. They need a friend who is a bit thick skinned, but who also knows when to draw the line for the ENTP. If they have a best friend who can be their partner in crime, that is the absolute best thing for them. They want someone who can be by their side and help them come up with exciting new ideas. There is nothing better than someone who can keep them entertained, even if it is just with a funny meme or joke. ISTJs want a best friend who is loyal and honest with them. They want someone who shares their values, and won’t insult the ISTJs life choices. Being able to communicate with someone about their day, and just have relaxing conversations- is very enjoyable for them. They also need a best friend who can appreciate their need for space sometimes. Someone who does not make them feel guilty for wanting to spend some time by themselves, that is very ideal for the ISTJ. ESTJs need a best friend who shares their same values and ideals. Someone who does not get nervous if the ESTJ goes on a tangent and becomes excited about whatever topic they are discussing. They want a best friend who they can laugh and joke with, and just enjoy their presence. They especially do best having a best friend who knows about their past, and can share memories with them. Ultimately though, ESTJs simply want someone who is loyal and steadfast. ISFJs need a best friend who can share in their passions and hobbies with them. Someone who will want to go out to the same nice restaurants, or even share a relaxing night in discussing their favorite movies. Whatever the ISFJ likes to do, they want to have a friend who they can share it with. They enjoy having someone to confide in, especially since they work very hard to make their loved ones happy. Having a best friend who listens, as much as they talk, that is absolutely the best thing for an ISFJ. ESFJs want a best friend who will give just as much as they take. They want someone who will not only share their feelings and thoughts with the ESFJ, but who also WANTS to hear about them in return. They find themselves feeling taken advantage of often, and truly just want a friend who won’t do this. They want someone who enjoys their presence, not what the ESFJ can do for them. A best friend who simply loves them for who they are, and wants the best for them. They also enjoy being able to share certain hobbies with their best friend, so that they can discuss whatever new obsession they have found together. ISTPs want a best friend who is upfront with them, and who respects their need for space. Having a friend who they can share their hobbies with, is also a great asset. ISTPs are often picky when it comes to who they let into their world. They want someone who they can trust and rely on when they need them. They will likely never ask for help, but just knowing that their friend supports them is the all they really need. ESTPs want a best friend who can be their partner in crime, and who will be by their side to share in many different adventures. Whether these adventures include going on a long road trip somewhere new, or just driving to get ice cream at midnight. ESTPs just want someone to spend time with, and laugh with about silly things. Having a best friend who will stand by their side no matter what, is definitely what the ESTP is searching for. ISFPs need a best friend who supports them no matter what. They want someone who is their biggest fan, and who connects with them on a much deeper level. ISFPs support their loved ones, and they simply want to feel this in return. ISFPs do not need a best friend who is just like them, and might even enjoy someone who has many differences. Most of all, they want loyalty and trust when it comes to their best friend. ESFPs want a best friend who enjoys their presence, and who will stand by them. Someone who likes to have fun, and who won’t judge the ESFP. They want someone they can trust to support their decisions, and who will appreciate them for who they are. ESFPs sometimes do not feel truly understood, even though outwardly they appear very social and likable. ESFPs want a best friend who they can share their secrets with, and who understands who they truly are.